Anindya Banerjee is a true blue football fanatic. He has been following this global sport since 1980. When he was young, the Delhiite (now settled in Mumbai) used to go to Kolkata every year during his summer holidays and would buy his way into a local team for a period of two months. For him, football is his second life that he still lives. “Here’s something to think about. Football is called the beautiful game. Whereas cricket, is a gentleman’s game. What would you rather watch? Messi dodging five players to score a goal on the top right hand corner of the net, or Gayle bludgeoning some poor bowler, over after over? Football is a simple game. One ball, 22 players and two goalposts. There’s purity in it. There’s sorcery,” says Banerjee, who is also the executive creative director of Scarecrow M&C Saatchi. Combined with on-ground initiatives such as the Union government’s complete support to Mission 11 Million, a football initiative that aims towards taking football to 12,000 schools in 37 cities across India; or the sheer commitment towards infrastructure (for instance, the West Bengal government spent more than Rs 100 crore ($15 million) in refurbishments before the FIFA U-17 World Cup); or the increase in investment from Indian companies in the likes of European leagues or deals with international football players are helping to create a groundswell for change in the Indian football story. Banerjee is among the 100 million Indian viewers who are glued to their electronic devices (TV, iPad, smartphones, etc.) to watch the ongoing FIFA World Cup 2018. Also, among the countries that did not qualify for FIFA World Cup 2018, Indian football fans have purchased the third highest number of tickets to attend the tourney. In India, football or any sport is no cricket. But every data point only reiterates the sheer headroom for growth due to this very fact. While India has the potential in terms of spectators and viewers, its FIFA ranking is still much lower than countries with 1/10th or 1/100th of its population. Conversely, while football is played by 200 countries and over 250 million people, cricket is played in barely 15-20 countries. Consequently, football attracts a disproportionate amount of sponsorship money worldwide. And there is every reason to expect this in India too. Sports industry stakeholders reckon that more football players pursuing it professionally and more earning avenues will enable a larger pool of trained football players, which in turn will help India create a better world-level team, and spark wider interest across sections of people instead interest from football fanatics only. “Football is a global sport, no. 1 across the world. If one looks at it from the outside, there are only a few bastions left. India is one of them. Interest at grass-roots level and at the elite level has grown manifold even in the last five years,” states Nikhil Sharma, founder and CEO of zlait Sports Management, a sports management company specialising in sports infrastructure, player representation, technical consultancy, marketing and sponsorship and media advisory. He points out that investments at the elite level would be up 5-7 times ever since the ISL has come in. There has been a sizeable growth in every possible field concerning football in India. “Investments, technical development, marketing, fan engagement and everything else that is associated with the sport. For example in the past five years or so, India now has over 10K licensed coaches. So you have more people who understand the intricacies of teaching kids. There is this speed that India seems to have caught on to,” adds Sharma. On more than one occasion, FIFA leaders have described India as the ‘sleeping giant of football’. The 2017 U-17 World Cup numbers reiterate this. “You will be surprised as to how many youngsters are picking up football. The older audience, in the age group of 30-50, is definitely still more inclined to cricket. But we believe millennials are drifting to football,” said Perseus K. Daruwala, director of Sporloc, India’s leading online sports platform, observing that the last World Cup’s viewership of over 1 billion people worldwide itself is indicative of its growing popularity. According to recent studies, the global football market is pegged at $56 billion which includes $14 billion of equipment. There are about 4-5 billion fans (including Indians) of FIFA worldwide and their number is expected to go up further. As a business, the clubs are worth billions of dollars. Revenue streams such as tickets, merchandise, sponsorship, advertising, broadcast rights, competition winning and media not just make it a lucrative business but also an opportunity to change lives. Broadcast revenue is now the largest revenue source for these football clubs with a 45 per cent share, whilst the shares of commercial revenue and match-day revenue have reduced to 38 per cent and 17 per cent, respectively. Let’s break this up from available India numbers. As per ESP Properties, in on-ground sponsorship monies, football clocked in $27 million (Rs 179 crore) in 2017. In team sponsorship, football made $14 million (Rs 98 crore) last year. Both numbers have increased over the previous year as have the franchise fee that grew 24.8 per cent. The key drivers have been the growth in the likes of ISL and also the advent of FIFA U-17 World Cup in India. A Rs 277-crore number may not look impressive in comparison to cricket (more than four times in like to like) but it makes football the clear number two sport in India. We are seeing Indian footballers, including Indian team captain Sunil Chhetri, also sign endorsement deals adding more advertising revenues to the ecosystem. It should also be noted that 2017 was the 10th year of the Indian Premier League and was riddled with economic challenges such as GST. Any growth in this year holds more value. According to Deloitte Football Money League 2018, the total revenue worldwide of the top 20 football clubs has reached a record high, increasing 6 per cent to €7.9 billion in 2018. The English Premier League, the top level of the English football league, is going northwards at $3.5-4 billion (approx.). While Manchester United is the world’s most valued club; other clubs such as Real Madrid, Barcelona, PSG and Chelsea are huge too. As a sport, it’s by far the biggest in terms of spectators’ base and cuts across demographics and cultures. Interestingly, India has the highest number of viewership among other countries. A back of the envelope calculation by Madhur Singhal, managing director of technology-led business research and solution firm Praxis Global Alliance, shows that global football ticketing revenues are at $30 billion but 80 per cent of it is in Europe. Even if a $6-billion revenue pool is considered outside Europe, given India’s population/economy size and the growing interest in football seen not only in the attendance at the U-17 World Cup but also the fact that Indian fans bought the highest number of tickets for the FIFA World Cup 2018, India should get at least $200 million of ticketing revenues alone. 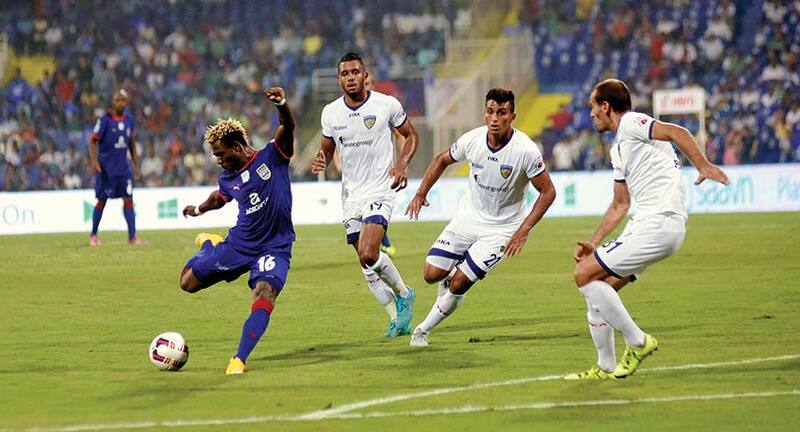 A very large part of football’s growth story in India can be attributed to the formation of the ISL. The IMG-Reliance-Star co-owned property witnessed a significant improvement in the quality of football, as well as an upswing in stadium attendances. In 2017, ISL saw the entry of Jamshedpur FC, owned by Tata Steel, and Bengaluru FC (parent company Jindal South West Holdings) into the league, making it a 10-team championship. In effect, this elongated the duration of the game to over 18 weeks, compared to 10 weeks, allowing promoters of Football Sports Development to grow fan loyalty and the engagement quotient, and giving brands more time with the property. While ISL is pursuing its mission, which is growing a liking for football in India and increasing exposure to the sport in the country, I-League needs some fillip to augment growth. The scheduling change made on account of the U-17 World Cup, where the ISL and I-League ran concurrently instead of following the other as was the case earlier, has set the template for what can be expected. As is the case across the world, the different tiers of India’s football leagues will run concurrently not only birthing more avenues for corporates connected with them but also establishing a second tier league of Indian club football. Even as the league format is picking up pace, Premier Futsal, a league that looked to channel money into Football’s short-form format and had international star power, is still to find its footing. “Football in India, to an extent, is reliant on investment by corporates. The corporates are answerable to their shareholders and the key word that underlines all their investments is returns. You can’t fault investors for looking to recoup their investment. However, that blueprint does not work for sports. While club and franchises do obtain income by way of sponsorship and centralised distribution, the operation costs of the teams are high and it is unlikely that any entity on the sports side of the ecosystem would be making money,” reveals Srinivasan Saimani, a sports, media and commercial lawyer as well as a FIFA Master Graduate. “The ISL itself would have a total investment reaching Rs 500 crore including team budgets, organisation budgets, sponsorships, broadcast, event management, grassroots activities and so on. Add another Rs 50 crore of the I-League plus a couple of crore of I-League and other tournaments being held currently,” adds Sharma from zlait, giving a sense of the current lay of the investments into the sport from leagues. “The ISL has brought in some riches for Indian professional footballers — historically dependent on public sector companies for jobs —over the four seasons of its existence. These earnings have given them a choice of savings too, besides options to spend. Before arriving at the I-League second-division outfit United Sikkim FC in 2011, Sandesh Jhingan had been rejected by six clubs. Fast-forward to 2018, and the 24-year-old is the captain of the ISL team Kerala Blasters, drawing a salary of Rs 1.2 crore for the season, making him among the highest-paid domestic footballers in the ISL,” explains a media source. 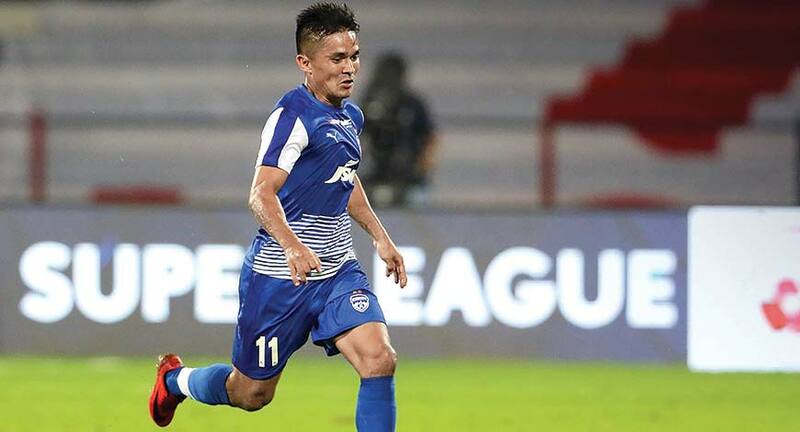 The source also pointed out that Bengaluru FC captain Sunil Chhetri (Rs 1.5 crore) and Jhingan both draw eight-figure salaries in the ISL. At the other end of the age spectrum is Mehrajuddin Wadoo, an employee with the Jammu and Kashmir Police. The 34-year-old defender draws a salary of Rs 43 lakh at Mumbai City FC. The ISL 2017 witnessed a spike of over 103 per cent in domestic players’ salary as compared to the inaugural year, as the 10 clubs together spent Rs 48.85 crore in 2017. While Indian leagues are going all out, it’s needless to say that it is the international leagues that generate the staunch fans and loyalty. “India has never been this football crazy. Over the past decade, there has been a huge rise in the popularity of the sport across the nation but the fanbase has taken to European football in a big way. Massive leagues such as the English Premier League, Spanish La Liga, the French Ligue and the ISL have opened up avenues for the professionals,” says Sachiin Joshi, chairman of Viiking Ventures, a conglomerate that has been supporting football and other sports. Football in India continues to fight decade-old challenges. “There are still underlying and visible problems that might blur the big picture that clubs are trying to look at. The first one is obviously the standard of the sport. Grassroots is a major part of development in any sport and India lacks the right training that has to be applied at a young stage in order to ensure a smooth transition to international football. There is also concern about the infrastructure. While focus on improving Indian football is the priority, the existing following for English and Spanish football are signs of encouragement that the sport’s popularity is set to eclipse that of previous decades,”says Joshi of Viiking Ventures. The structure of football clubs in India is another area that needs more clarity for a structured growth of the sport itself. Newer markets have opened up to football as is seen in the increase in the number of teams. The work being done in taking the sport across cities in India will also play a role in fueling growth. “A lot can be done at both the policy and the implementation level. If a uniform policy with inclusion of schools, colleges, clubs and the entire system can be brought under the same gambit, it can help the sport.Focus on women football where India has the potential to do much better internationally and involving more corporates to ensure CSR funds are directed towards developmental activities will also go a long way,” points out Sharma. The EPL was the first to really tap into the vast market in India. The traditional ‘big four’ of English football — Arsenal, Liverpool, Chelsea and Manchester United — triggered the craze and it has only caught on from then. Several international deals saw a number of Indian brands enter into with Premier League clubs. For example, HCL with Manchester United, Wipro with Chelsea, Apollo with Manchester United and Crystal Palace, and MRF signed up with West Bromwich Albion, Newcastle United, and WestHam United. In terms of the number of fans for the major clubs in England and Spain (Arsenal, Manchester United, Chelsea, Liverpool, Barcelona and Real Madrid) across the biggest countries in the world, India is on top for most clubs. It is clear that football still has a long way to go before it can match cricket in terms of popularity and revenue generation, but there is no doubt that it has caught the imagination of the youth of the country. With the growing popularity of local and national tournaments and the increasing interest from foreign football clubs to capture the Indian market, it is only a matter of time before football creates a class of its own in India.